100% Complete and Balanced Nutrition for normally active cats of all breeds and ages. Variety of fun shapes and tasty chicken, shrimp, tuna, turkey and fish flavors. 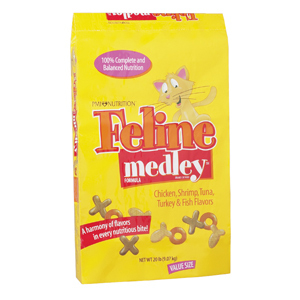 A taste sensation that cats love! High quality nutrients needed for bright eyes, strong bones, healthy teeth, shiny coat and the energy for an active life. Vitamin A, E and the mineral Zinc to help maintain a healthy immune system. Taurine to promote normal eyesight and Proper pH for healthy urinary tract. INGREDIENTS: Ground yellow corn, chicken by-product meal, corn gluten meal, soybean meal, animal fat (preserved with BHA and citric acid), sodium bisulfite (a preservative), calcium carbonate, animal digest (source of shrimp, tuna, turkey and fish flavors), fish meal, dried egg product, dried whey, dried brewers yeast, salt, dextrose, monocalcium phosphate, choline chloride, potassium chloride, artificial color (red #40, yellow #5, yellow #6, blue #1), taurine, ferrous sulfate, zinc sulfate, vitamin E supplement, zinc oxide, niacin, copper sulfate, manganous oxide, calcium pantothenate, vitamin A supplement, biotin, thiamine mononitrate (source of vitamin B1), riboflavin supplement (source of vitamin B2), pyridoxine hydrochloride (source of vitamin B6), vitamin D3 supplement, calcium iodate, vitamin B12 supplement, folic acid, cobalt carbonate, menadione sodium bisulfite complex (source of vitamin K activity), sodium selenite.